يقع في بوين, Castle Motor Lodge إنه المكان الأنسب لاكتشاف Whitsunday Islands و ما يحيطها. إن موقعه الجيد الذي يبعد 1.Km فقط عن مركز المدينة يساعد النزلاء على الاستمتاع بمعالم المدينة ونشاطاتها. يوفر الفندق بفضل موقعة الجيد وصولاً سهلاً إلى أهم معالم المدينة.
. يقدم Castle Motor Lodge خدمات لا غبار عليها وكل أشكال اللياقة وحسن الضيافة اللازمة لإسعاد ضيوفه. يمكن الاستمتاع بمجموعة من الخدمات على أعلى المستويات في الفندق كمثل واي فاي مجاني في جميع الغرف, Wi-Fi في المناطق العامة, ركن للسيارات, قاعات اجتماعات, غرفة عائلية. يمكن للنزلاء الاختيار من ضمن مجموعة من الغرف المصممة بعناية لتعكس جواً من الراحة، والتي يتجاوز عددها 32. يمكنك طلب اللائحة الكاملة للخدمات في الفندق ومن بينها حوض الاستحمام, حمام سباحة خارجي, حمام سباحة داخلي, سبا, حديقة. اكتشف مزيجاً ساحراً من الخدمة الاحترافية والخيارات الواسعة من وسائل الراحة والمتعة في Castle Motor Lodge. 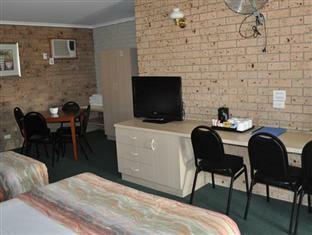 The rooms were comfortable, clean and presented well. Staff were very hospitable and friendly and happy to assist. 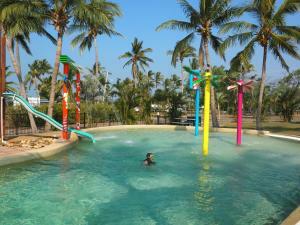 The pool area is lovely which is welcoming in sunny Bowen. A great stay!!! Nothing was too hard for the staff, very easy going. Excellent. Recommend to all others! Lovely staff and great service. Clean and comfortable rooms. Great family friendly swimming pool. Very quiet. We stopped here for the one night on our way down from Townsville to Airlie Beach. 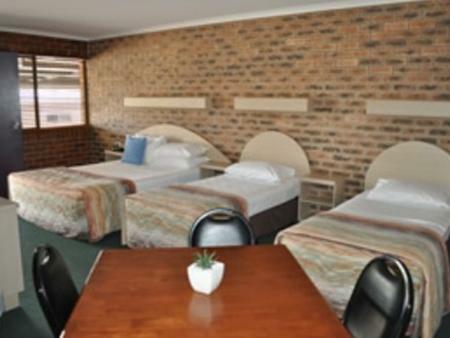 A centrally located motel run by extremely friendly welcoming owners. For the price of the room, our stay exceeded our expectations. We only stayed one night as we were passing through on our way to Cairns, but we were delighted with the little touches that carried the castle theme through, from the drawbridge you drive over to the swords and shields in the restaurant. Excellent customer service, and a fantastic breakfast. The room was spacious, as was our car park right outside the front door. Having all rooms on ground level is excellent when you have a lot of luggage. Good sized television, tea and coffee making facilities and the bed was comfortable. Our stay was very nice and we look forward to our next visit. Overall it was a nice stopover. The staff was nice and friendly but the place is overpriced! Security, parking, cleanliness of rom. Disappointed with wifi connection, otherwise no problems. No restaurant. Great Breakfast and dining area. Very Comfortable and stylish! Things went well from the moment we arrived. The owners were kind and friendly. Room was great and the dining area was huge. It had been fitted out with a Theme and the staff were very good. Food Excellent and breakfast was amazing... all in the same price! I stayed only one night at the Castle Motor Lodge. Tue staff was friendly. The room was nice, quiet and very clean. Breakfast (continental) had a good selection of quality items. I would definitely recommend the motel. The staff were very pleasant and easy to deal with. The hotel presented well. Lovely comfortable beds, everything we needed. Unfortunately we were put off in the morning when a cockroach was crawling in our bed and then another one across the floor! Wir sind auf der Durchreise und von all den Unterkünfte bis jetzt hat dieses das netteste Personal. Die Zimmer waren super sauber. Es gibt auch eine Waschküche im Hotel, welche umsonst genutzt werden kann. Wir waren super zufrieden!